Pam’s Pictorama Photo Post: Who can resist taking a photo of new kittens? Clearly the instinct goes back pretty far, as shown here. This card is very beaten up, but I do love it. The alternating height of the women, black and white of the skirts – and in fact kittens! – is wonderful. 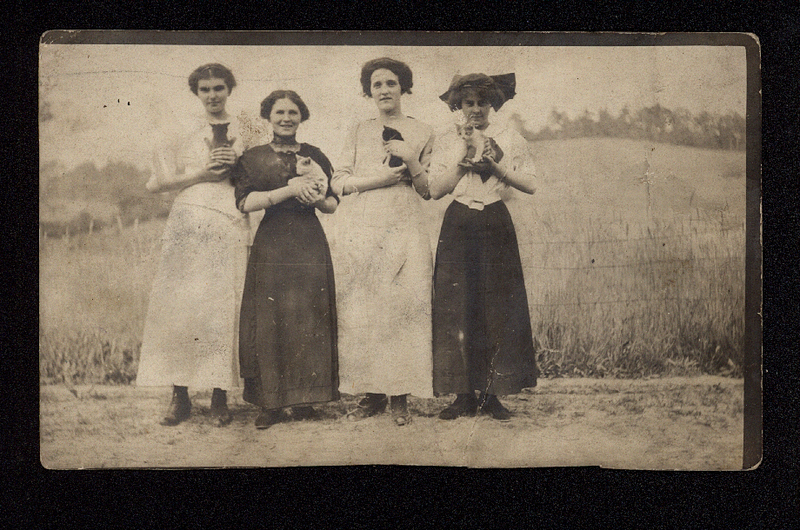 It is a well composed and thoughtfully executed photo, in addition to the design of the women and cats, the foreground divides against the rising background nicely. It could almost be a set, but is not. For all of that, it is very poorly printed – negative unevenly placed and black edges showing on two sides, and printed upside down on the postcard stock. Sloppy. Makes me assume that the person who took it was not the person who printed it. Either that or they couldn’t help having a great eye, even if they didn’t much care about the end product of their work. Nothing is written on the back and it was never mailed. The shorter women of the four, #2 and #4, have tiny, nipped-in waists and are the more fashionably dressed. The women in white seem to be a bit tattier – especially their shoes. No one really looks a lot alike among the four, although if you really study them a case could be made for them being sisters or otherwise related. Among the kittens, of course I have a soft spot for that black one, #3, curled up contentedly in the hands of the one woman. Cat #1 has annoyed ears, #2 napping, and #4 is the action one – poised for adventure. Let him get at it!